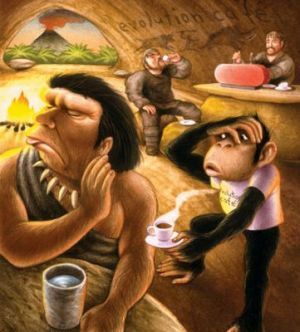 An evolutionary perspective; did humans evolve to take drugs? About 4000 plants and fungi are known to yield psychoactive substances. It is though that these plants evolved to produce toxins that would repel predators, deterring threats from herbivores and pathogenic invasions. They evolved to discourage those who chanced to eat them by producing such a disturbing or unpleasant effect that they wouldn’t return. Yet strangely, humans (and other animals) have kept coming back for more. Evidence points to a long history of co-evolution between humans and plants, and it is thought that just as plants developed the ability to synthesise chemicals so closely aligned with brain neurotransmitters, over time, humans developed certain adaptations which allowed them to make use of the effects of such substances. In other words, some co-evolutionary activity between mammalian brains and psychotropic plants occurred, meaning they interacted ecologically and therefore responded to one another evolutionarily. To understand how this might have occurred, we need to look beyond the concept of psychoactive substances as just drugs of pleasure, medicine or abuse. they cause changes in emotion which influence motivation, learning and decisions. These changes have the potential to temporarily increase fitness, or at least give the illusion of increased fitness, by stimulating positive emotions and negating negative emotions (Nesse and Berridge 1997). There is compelling evidence that coevolution has occurred. So whilst there is much evidence for the survival advantages gained from the use of psychoactive substances throughout human evolution, and evidence for the ways in which our bodies have evolved to cope with the toxicity of such substances, what of the intoxicating effects of alcohol and other mind altering psychoactives? The consumption of intoxicants satisfies a basic need to alter the normal ego-centred consciousness, and it seems whether by the use of brain altering substances, meditation, or even the playground roundabout, humans will find a way. Other theories of the evolution of drug use and intoxication are discussed in “social”.